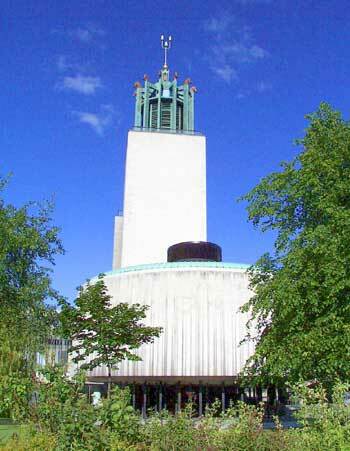 Newcastle Civic Centre, designed by City Architect George Kenyon. The cool white office blocks and mushroom capped round chamber were designed by the City Architect, George Kenyon. The main 12-storey block is capped by a copper lantern and beacon with three castles from the coat of arms 250 ft above the ground. A carillon in the tower plays Tyneside tunes four times a day. Impressive use is made of modern sculpture with a 16 ft long River God Tyne and Swans in Flight both by David Wynne.